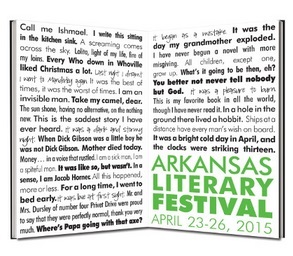 Many activities today with the Arkansas Literary Festival! Karen Joy Fowler, Janis F. Kearney and Jamaica Kincaid on a panel – Acts of Empowerment at the Darragh Center. Arree Chung will discuss Ninja! At the Hillary Rodham Clinton Children’s Library and Learning Center. Megan Abbott & Ben Percy on a panel – Thrill Me in the Darragh Center. Michael Kardos & M.O. Walsk on a panel – The Unputdownables at the Darragh Center. Quan Barry and Brock Clarke on a panel – Luminosity at the Darragh Center. Kevin Brockmeier and Tania James on a panel at the Darragh Center. 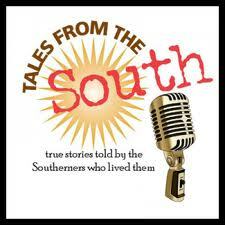 Tales From the South” is a radio show created and produced by Paula Martin Morell, who is also the show’s host. The show is taped live on Tuesday. The night is a cross between a house concert and a reading/show, with incredible food and great company. Tickets must be purchased before the show, as shows are usually standing-room only. The program takes place at Starving Artist Café. Dinner is served from 5pm to 6:30pm, the show starts at 7pm. Admission is $5, not including dinner. Tales from the South airs on KUAR Public Radio on Thursdays at 7pm.